Close-up of dry, red adzuki beans. Sweet and nutty, the adzuki bean is a small red-brown bean frequently used in Japanese desserts. Like other legumes, the adzuki bean is a nutritional powerhouse, rich in protein, fiber and folic acid. 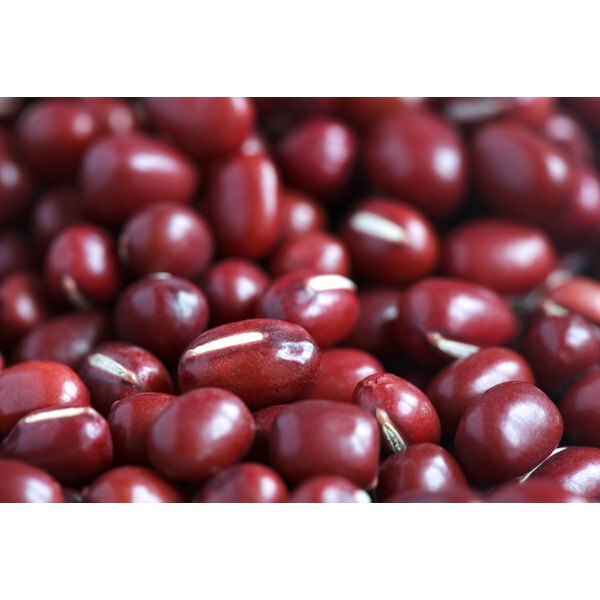 Knowing the nutrition information for the little red bean can help you see its benefits in your diet. If you're trying to lose weight or maintain a healthy weight, eating adzuki beans may help. A 1/2-cup serving of cooked adzuki beans, which weighs 115 grams, contains 147 calories. 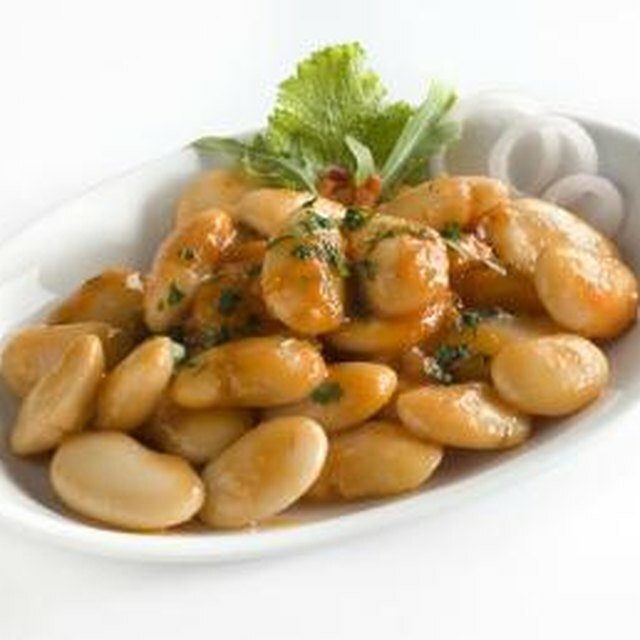 According to the British Nutrition Foundation, adzuki beans are a low-energy-dense food, with 1.3 calories per gram. This means they're low in calories compared to serving size and fill you up with fewer calories, making it easier for you to balance your calories for a healthier weight. Most of the calories in the adzuki beans come from its carbohydrate content. A 1/2-cup serving of cooked beans contains 28 grams of carbs. The Institute of Medicine recommends that 45 to 65 percent of the calories in your diet come from carbs. Some of the carbs in the beans come from its fiber content, with 8 grams of fiber in the 1/2-cup serving. Getting more fiber in your diet may reduce your risk of type 2 diabetes, obesity and heart disease, according to the 2010 Dietary Guidelines for Americans. Women need 25 grams of fiber a day, while men require 38 grams. Adzuki beans are a good source of protein and contain very little fat. A 1/2-cup serving contains 8 grams of protein and less than 1 gram of fat. The Institute of Medicine recommends you get 10 to 35 percent of your calories from protein and 20 to 35 percent from fat. While the beans are a good source of protein, they do not contain all of the essential amino acids, making them an incomplete source of protein. However, you should be able to meet your amino acid needs if you eat a variety of foods, including vegetables and grains, throughout the day. A 1/2 cup serving of cooked adzuki beans meets 12 percent of the daily value for iron, 13 percent of the daily value for potassium and 35 percent of the daily value for folic acid. Iron is responsible for getting oxygen to your muscles and organs and also makes up part of the enzymes that help you digest food. Eating more potassium-rich foods like adzuki beans may help improve blood pressure, according to the 2010Dietary Guidelines for Americans. Folic acid is a B vitamin that is needed to make new cells, and it's especially important for women of childbearing age. Adequate intakes helps prevent birth defects in babies.